We are happy to offer a variety of services to our community. We offer prenatal care for low risk pregnancies and deliver babies at Warren Memorial Hospital. Whenever possible preconception counseling, or talking with your provider before you get pregnant, is recommended. Women trying to get pregnant should plan a diet high in folic acid or start a prenatal vitamin to help avoid birth defects. We provide nursery services to Warren Memorial Hospital and provide the full scope of care for newborn infants, including breastfeeding education and support. Our services grow with your child through all their stages into adulthood. We provide a full spectrum of gynecological services including pap smears, contraceptive services, IUD placement or removal, natural family planning, and colposcopy. We have multiple physicians in the office with a special interest in the needs of geriatric patients. Our goal is to help mature patients maintain healthy, active lifestyles. Also, we provide care to the residents of Lynn Care Center as well as many neighboring assisted living facilities. We perform joint injections, splinting and minor casting in our office. We also have trained osteopathic physicians on site who are skilled in musculoskeletal evaluation and manipulation. We admit to Warren Memorial Hospital. One of our doctors is always available to manage our own hospitalized patients and communicate with families. We perform a broad range of minor surgical care including laceration repair, excision and biopsy of abnormal skin lesions, and no scalpel vasectomy. We perform many lab services in our office and are usually able to obtain blood or specimens in our office for tests we send out to regional laboratories. Our electronic interface with the labs allows rapid turn-around of results. Patients can use our Follow My Health Patient Portal on this site to review their labs online. We have a PhD pharmacist from Shenandoah University School of Pharmacy who is available to our patients for medication reviews as well as specialized teaching. We encourage men to stay up to date in routine preventive screening in order to live active and healthy and productive lives. We also treat a wide spectrum of problems specific to men, such as prostate and erectile problems, and offer no-scalpel vasectomies as well. 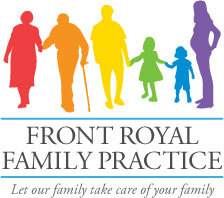 The FRFP Acute Walk-in Clinic is available to established patients for urgent and minor illnesses. No appointment is required to be seen. Patients will be seen on a first come first served basis.